Vaughn Gittin Jr. helms a pretty wicked Ford Motor Company Mustang as his main drift machine. It's worked on by his RTR crew, and it's packing 550 horsepower. 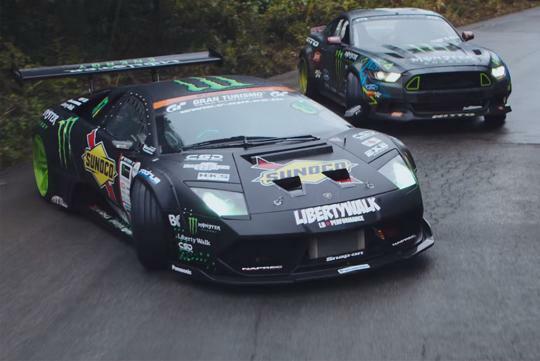 Daigo Saito has taken a different approach with his slideways rocketship. His choice of vehicle is a Lamborghini Murcielago that's been converted from all-wheel drive to rear-wheel drive but still comes equipped with a V-12 engine. This rig is good for 650 horses. The two have decided to face off. The battle unfolds in Niigata, Japan at a place called the Russian Village. It's abandoned. It's worn. It's perfect for two loud machines to tear about the place in what appears to be an almost post apocalyptic automotive dance ritual. The Lamborghini and the Ford are praying to the God of the Tire that now runs the world in which they live. Over the last few years, we've become a fan of what Luke Huxham and his team have been bringing to the automotive video table. The production values are high, the cuts are fantastic, and the subject matter is always entertaining. This one is just another example of the excellent work that Huxham and his team have been churning out, and we can't wait to see what that crew cooks up next.